The majority of U.S. facilities seeking control of glass furnace emissions have chosen Tri-Mer UltraCat Catalytic Filter Systems. Worldwide, more than 3 dozen glass furnaces use Tri-Mer ceramic filter technology and advanced Tri-Mer system design. These systems are operating in flat glass, container glass, and tableware. In the United States, Tri-Mer Catalytic Filter Systems readily meet EPA and state requirements for particulate (PM), SO2, HCl, metals, and Nox. NOx removal is a small fraction of the “cost in $/ton of glass” of converting to oxy-fired. Tri-Mer’s integrated glass furnace emissions system is less costly than ESP ducted to a stand-alone SCR. UltraCat Catalyst Filter projects have been awarded primarily on initial price and operating cost, with superior performance an important added benefit. Catalytic Filter Systems require much less sorbent than ESP to achieve equivalent SO2 removal efficiency. This advantage is greatly magnified by the exclusive Tri-Mer Sorbert-Saver technology. Catalytic Filters use less energy than ESP + SCR. Total “cost of ownership” is lower, even with filter replacement at the 10-year minimum. Catalytic filters currently (2018) have a nine year proven history in glass, with no signs of filter or catalyst failure. The Tri-Mer system is less complicated, and requires less maintenance, than ESP + SCR. Systems are “future-proof” with significantly higher PM capture (including metals). When DSI (dry sorbent injection) is used for acid gases, Catalytic Systems have higher SO2 capture potential than ESP. UltraCat Filter Systems have longer catalyst life because the catalyst is protected within the filter media. Tri-Mer’s UltraCat is all-in-one: PM+SO2+metals+NOx, and requires less total footprint. Tri-Mer’s overwhelming experience in contrast to the competition insures a proven system design, and guaranteed on-time schedules on-budget project delivery. 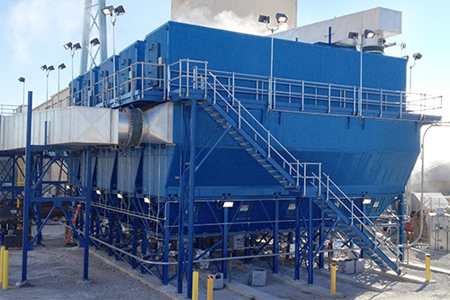 Tri-Mer’s UltraCat glass furnace emissions filters deliver significant advantages in terms of sorbent use, maintenance requirements, and redundancy. Tri-Mer’s Ceramic Catalyst Filter Systems have significantly higher PM capture capability (including metals) than ESP, with no “selective capture” issues. When DSI (dry sorbent injection) is used for acid gasses, this glass emissions option has higher SO2 reduction potential than ESP. 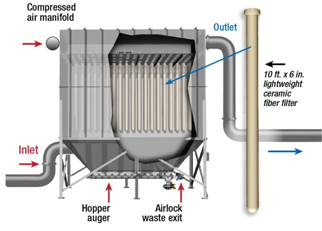 UltraCat Catalytic Filter systems require much less sorbent to reach a given SO2 removal than ESP. This is because the sorbent accumulates on the filter surface, creating a filter cake. All the gas must pass through this cake, adding exposure and time for sorbent chemistry to occur. This is true for any sorbent, SBC or hydrated lime. Another advantage is the built-in redundancy inherent in this multiple module system. There is no “control device” bottleneck that can compromise furnace operation. To meet the flow requirements, several housing modules are placed in parallel. In the rare event that service is needed for one module, the entire flow volume is directed through the other modules, which temporarily operate at a high pressure without a loss of performance. The module under service is then brought back online and the pressure returns to normal. This equates to a significant reduction in the cost of ownership compared to ESP. Standard ceramic filters have been used for PM control by the U.S. military at munitions destruction facilities in Indiana, Utah, and Oklahoma since 2000, and there are hundreds of ceramic filter systems operating worldwide. With the additional capability of NOx control, these filter systems have become the technology of choice for many applications. The glass industry recognized the merits of the technology and responded with swift adoption. Complete glass furnace emissions systems with integrated dry sorbent injection and ammonia injection are available from Tri-Mer Corporation. Tri-Mer has successful projects in tableware, container, and flat glass throughout the US. Central and South America also benefit from Tri-Mer’s turnkey engineering, project management, and installation services. In addition to glass emissions industry, there is a fast-growing base of successful systems serving a broad range of industries. Tri-Mer catalytic ceramic filters use glass emissions filter technology with nano-bits of SCR catalyst embedded in the walls. Filters are placed in housings and operate similarly to a “reverse pulse jet ceramic baghouse.” The filters are 10' long and 6" wide, with a wall thickness of approximately ¾ inch. The micronized catalyst offers a larger surface area for reaction than conventional SCR, with virtually no diffusion restriction. The catalyst particles are micro-porous, and due to their small size, they catalyze the gas phase reactions without diffusion and restriction (i.e. almost 100% utilization of the catalyst intrinsic activity) as opposed to usual pellet or monolithic catalysts. In industrial plants, the conventional catalyst types typically operate with 5-15% catalyst effectiveness in the SCR (Selective Catalytic Reduction of NOx by NH3). All catalysts can be severely compromised by particulate blinding of the surface, chemical interactions on the surface with particulate, and gas phase poisons. With the catalytic filter system, particulate is captured on the filter surface. The nano-catalyst is almost completely protected inside the filter, virtually eliminating particulate-type interactions and extending catalyst life. Regarding gas phase, the proprietary catalyst formulation is engineered for extremely low conversion of SO2 to SO3 (less than 10% of some competing catalysts) and is immune to HCl. Developments in ceramic filter technology offer the industry a powerful, proven strategy for meeting regulatory requirements for glass furnace emissions.